Parade of One is a project that I started by accident, and it has become my life. Here’s the story: On a whim, in 2009, I decided that instead of having a Birthday Party, I’d have a birthday parade. I emailed all my friends and told them my planned route, snaking through Brooklyn, Queens, and Manhattan. I said that if they wanted to join me for some leg of the journey, I’d love to have them along. If not, I’d be just as happy for it to be a Parade of One. It turned out to be a beautiful sunny day, and for some parts I was joined by friends and even curious strangers and for other parts I was happily parading alone. From the experience, I learned that I really liked reaching all kinds of people and not just the types who would be in this or that venue at my usual gigs. In the public spaces of a city like New York there’s potential for so much more social transgression in performance. So from that little birthday parade I decided to expand my street performance activities internationally, and the first place I went was Rwanda. I’d for several years already taken a strong interest in the country from reading about the 1994 Genocide against the Tutsi. My grandparents were Holocaust survivors, so I had and still have a a lot of curiosity about people from other cultures and regions who’ve experienced similar trauma and social conditions. 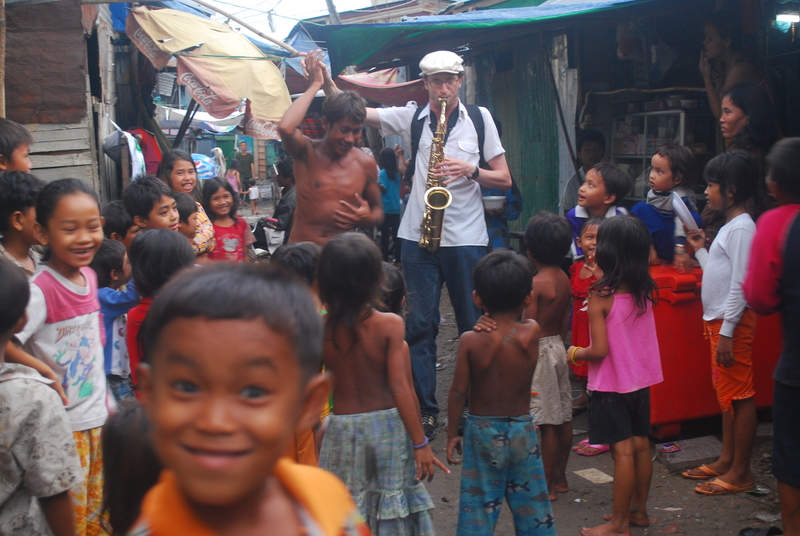 In addition to Rwanda, I’ve visited Cambodia and Vietnam with this project, giving street performances, visiting schools, and collaborating with local musicians. There’s been a film about it by Kivu Ruhorahoza, and now the project is going in new directions, as I’’ve recently had guest musician, Sophie Nzayisenga, from Rwanda visit New York.